When I lived in the UK, I enjoyed the occasional bowl of whitebait but I couldn’t believe my eyes when I moved to New Zealand and found that our whitebait are the size of small matches rather than large pencils. I have eaten them, and even enjoyed them in a guilty way. Why guilty? I am used to eating eggs, whether from chicken or fish, but am more comfortable with the prospect of allowing the offspring to grow a bit before I devour them. Our whitebait are the size of small matches. 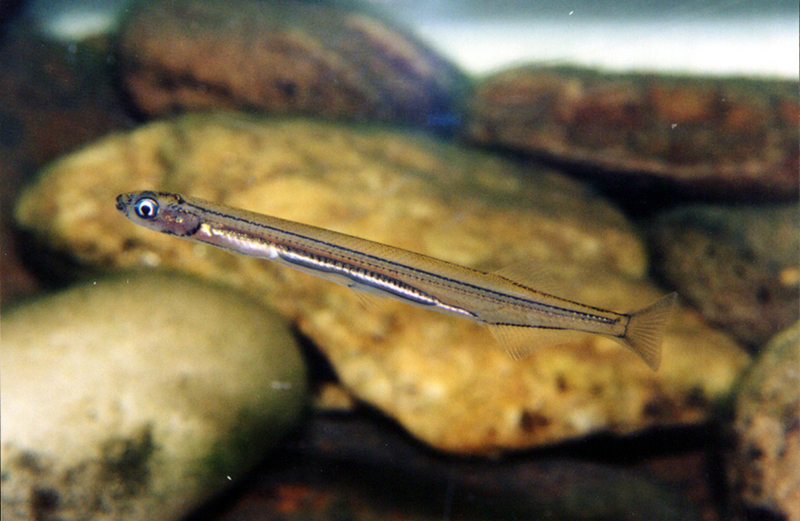 Working in DOC, I follow the arguments about managing streams and their margins and, amongst other things, the impacts of riparian management on the breeding cycle of our native galaxiids, which, when harvested as babies, are our whitebait. My interest took a new turn when I learned that a giant kokopu had set up home in our local stream in Wellington. I grabbed my camera and went on big game safari. When I saw this beautiful beast, which seems to be about 20 cm long, it was me rather than the fish that was hooked. On a second visit, in brighter lighting conditions and from a better position, I was able to see it in its full splendour. It is coloured like the night sly, framed with reddish fins. After some frantic reading, I understand that the name galaxiid refers to its patterning that it reminiscent of a galaxy. I also read that it feeds on small koura and any insects that happen to fall into the stream. When I saw the size of its mouth and its fierce array of teeth, I realise that it must be a monster for unsuspecting invertebrates. I have no pretence about being a ‘fishologist’ but its swelling belly made me wonder if it is a mum-to-be. Having shown the photos to others who are more familiar with these things, it seems to be likely, so the safaris will continue. 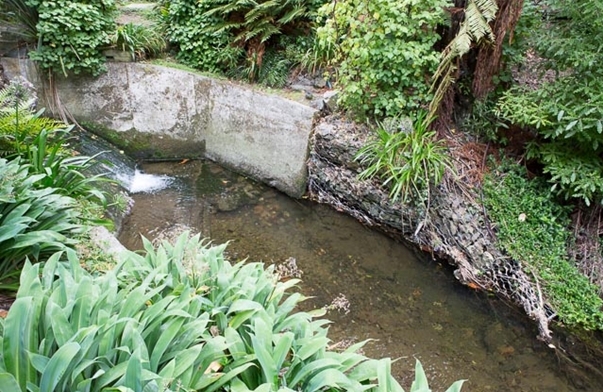 I have lived in my house since the mid 1980s and been aware over the years of the great efforts that have been made in cleaning up the stream, reducing pollution, looking after its surrounding vegetation and protecting its banks from erosion. In this urban landscape, all of that hard work is paying off. ‘My’ giant kokopu has made its home under a gabion basket that reinforces the bank against erosion during the periods of intense flow that follow heavy rain. With so much asphalt and so many storm water drains that feed the stream, the water flow can quickly change from a trickle to a raging torrent, the back to a trickle as the water flows into the harbour. All of this, in some mysterious way, is an essential part of the life cycle of these beautiful fish, and it all happens in urban Wellington. Is this really a mum-to-be? Is there a dad-to-be on hand to fertilise the eggs? Where will this happen, and will there be a happy ending? What’s more, will I ever find out? I think that a few more safaris are needed. Is this really a mum-to-be?